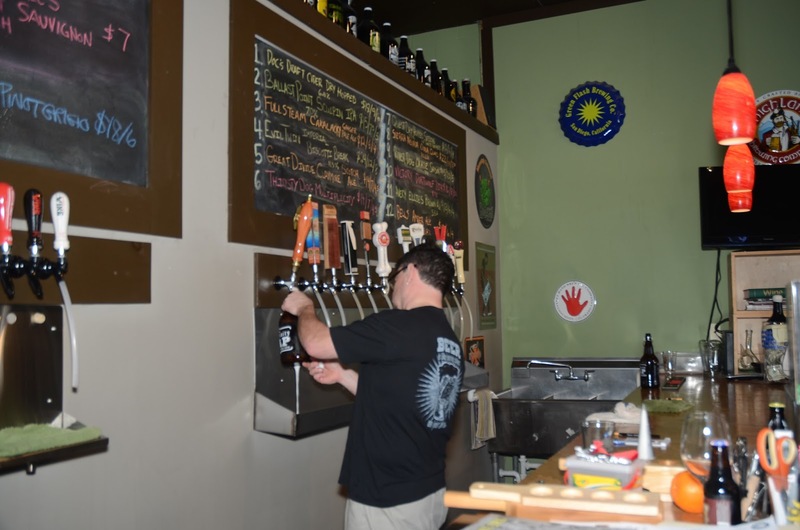 This week we put a very familiar face from the craft beer community in the spotlight, Mike Okupinski, co-owner with Ed Buffington, of The Community Tap, Greenville's first all-craft beer retailer. Mike, whose first introduction to real beer was courtesy of his older brother at a Pennsylvania music festival where he learned that he liked porters, left his day job, as we say, in 1999 to fill what he saw as a need in Greenville for a spot dedicated to offering craft beer to a growing population of folks who appreciated this new phenomenon. I got to know the Tap before I even lived here. Combining visits to relatives and research on a possible retirement location, we explored Greenville back in 2012 and, being serious craft beer fans already (our CA hometown was less than 10 minutes away from Lagunitas and Russian River Brewing), we learned right away that this was the place where we were sure to find beer we liked. It's been that way ever since. Ed, seen here at the chalk board, and generally known as the "wine guy," keeps a select inventory of small vintage wines, many of which are bio-dynamically grown. He'll be happy to explain what that means. One of his and Ed's early challenges (besides weird SC alcohol laws) was to acquaint people with this new thing called a "growler," which had first been introduced in Telluride, CO, at a music festival the year before. Basically, it's a glass container (tho' metal ones are now available) in the popular 32 oz. or 64 oz. sizes, which is carefully filled from a tapped keg, sealed and taken home to enjoy later. Until the pint law came into effect in 2010, that was the core of the business, since until that time only small tastes could be offered. I don't recall my first meeting with Mike but I'm fairly certain it would have been at one of the tasting events the Tap is known for. Certainly it was in their previous location, couple doors down from where they are now. 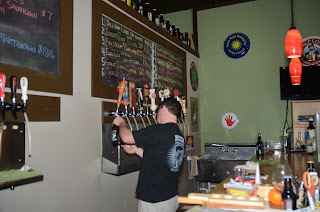 The original taproom before the 2014 move. These days I most often see Mike pouring tasting samples, either at the Tap during one of their almost weekly tap takeovers, or at one of the many craft beer festivals happening around our town. Mike is well known as a people person, another reason for Tap's success. With Todd Hamrick, Anderson Valley regional rep, for a very popular AVBC tap takeover. Mike knows his beer and always takes the time to describe a beer's characteristics. Their Third Annual Craft Beer Festival, at the Downtown Airport. Looking to the future, Mike anticipates continuing to do the things that have made the store so successful, only more of it. Adding private and corporate events, even out of state ones, are part of the plan and possibly even adding another space. Fund raising event, this one for BreastFest. Everyone likes a bottle share, and the chance to find a new beer to try and tap in. Tap's new dinner series featured Founders Brewing's beers with Scott Olin, (center), Sales Rep, presiding. Food by GoodLife Catering. As Mike says, "it's a great industry and a pleasure to own a [craft beer] business in this growing, developing city." As a member of this growing population, I'd like to say that it's a pleasure having The Community Tap as part of our craft beer community and making it possible to try some of the best beers being made today. Also, thanks to Anna Okupinski for her assistance with the in-store photos.